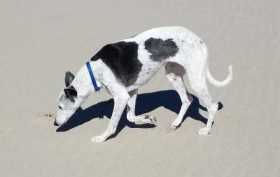 Pepper is a 12 yr. old black and white Whippet. She is mostly deaf and was last seen behind the Redmond Oregon airport. She is wearing a blue collar with a rabies tag and vet number on it. She is not chipped. We miss her desperately. Please help..